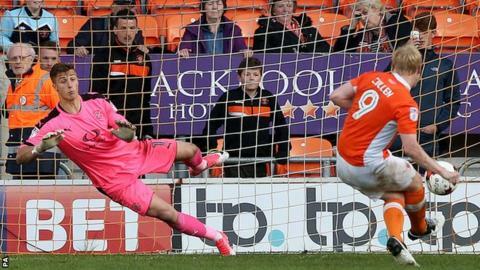 Mark Cullen scored a hat-trick as Blackpool beat Luton in their League Two play-off semi-final first leg. Ex-Hatter Cullen gave the Tangerines the lead with a low strike that keeper Stuart Moore could not keep out. Dan Potts' side-footed strike from Justin James' cut back and Isaac Vassell's sweet hit then put Luton ahead with two goals in two minutes. But Cullen's superb 25-yard curling effort levelled the tie and he scored his third from the penalty spot. The Tangerines will take their one-goal advantage to Kenilworth Road for the second leg on Thursday (19:45 BST). After Cullen scored his brilliant second goal, Luton captain Scott Cuthbert wrestled Tom Aldred down in the penalty area to allow the striker to get his third from 12 yards. Cullen was top scorer at Luton in his final season at the club but joined then League One side Blackpool for a fee of £180,000 in 2015. The Tangerines suffered back-to-back relegations last season and are playing in the fourth tier for the first time in 15 years, but Gary Bowyer's first full campaign at the club has given them a chance of an immediate return to League One. Luton, who finished fourth in League Two, had beaten seventh-placed finishers Blackpool twice already this season and had won their last six games before the defeat. "We worked the first goal really well but we then had a crazy five minutes and that's something for us to learn from and get ready to go again on Thursday. "The mentality's been the most pleasing aspect for me - the mentality we showed, and our game management, came to the fore after half-time. "Mark Cullen is a goalscorer. He had two goals and I couldn't see anybody else taking that penalty off him, but he showed bravery and he put it away well." "We showed naivety in our defending and that's what cost us. Going forward, there was no problem at all. "I didn't expect to concede three goals - we have the second-best defensive record in the league - but we have, and now all we can do is make sure we don't concede any more. "An open game will suit both teams in the second leg, but it won't just be an open game - we'll have a gameplan to win the game, and if we do that then we're still in the tie." Match ends, Blackpool 3, Luton Town 2. Second Half ends, Blackpool 3, Luton Town 2. Delay in match Kelvin Mellor (Blackpool) because of an injury. Attempt blocked. Olly Lee (Luton Town) left footed shot from the centre of the box is blocked. Attempt blocked. Ollie Palmer (Luton Town) right footed shot from the centre of the box is blocked. Assisted by Olly Lee with a headed pass. Jordan Flores (Blackpool) wins a free kick in the defensive half. Delay in match Pelly Ruddock (Luton Town) because of an injury. Delay in match Andy Taylor (Blackpool) because of an injury. Attempt missed. Alan Sheehan (Luton Town) left footed shot from the left side of the box is close, but misses to the right following a corner. Corner, Luton Town. Conceded by Andy Taylor. Substitution, Luton Town. Ollie Palmer replaces Lawson D'Ath. Substitution, Blackpool. Ian Black replaces Mark Cullen. Attempt missed. Brad Potts (Blackpool) left footed shot from outside the box is high and wide to the left. Assisted by Jordan Flores. Substitution, Blackpool. Jordan Flores replaces Neil Danns. Lawson D'Ath (Luton Town) is shown the yellow card for a bad foul. Nathan Delfouneso (Blackpool) wins a free kick in the attacking half. Substitution, Luton Town. Jack Marriott replaces Isaac Vassell. Attempt blocked. Andy Taylor (Blackpool) right footed shot from outside the box is blocked. Assisted by Jack Payne. Attempt blocked. Dan Potts (Luton Town) right footed shot from the left side of the box is blocked. Attempt blocked. Pelly Ruddock (Luton Town) right footed shot from the centre of the box is blocked. Substitution, Blackpool. Nathan Delfouneso replaces Kyle Vassell because of an injury. Goal! Blackpool 3, Luton Town 2. Mark Cullen (Blackpool) converts the penalty with a right footed shot to the centre of the goal. Penalty Blackpool. Tom Aldred draws a foul in the penalty area. Penalty conceded by Scott Cuthbert (Luton Town) after a foul in the penalty area. Neil Danns (Blackpool) wins a free kick on the left wing. Alan Sheehan (Luton Town) is shown the yellow card for a bad foul. Hand ball by Alan Sheehan (Luton Town). Delay in match Mark Cullen (Blackpool) because of an injury. Attempt missed. Clark Robertson (Blackpool) header from the centre of the box is too high. Assisted by Jack Payne with a cross following a corner. Corner, Blackpool. Conceded by Glen Rea.